I’ve got to say that I’ve been anticipating this day with great excitement! Ever since Dad planted his potato tower back in the springtime, I’ve wondered about his rash and yet inventive experiment in potato planting. What would it produce? Bushels and bushels and bushels of lovely potatoes, or . . . not? 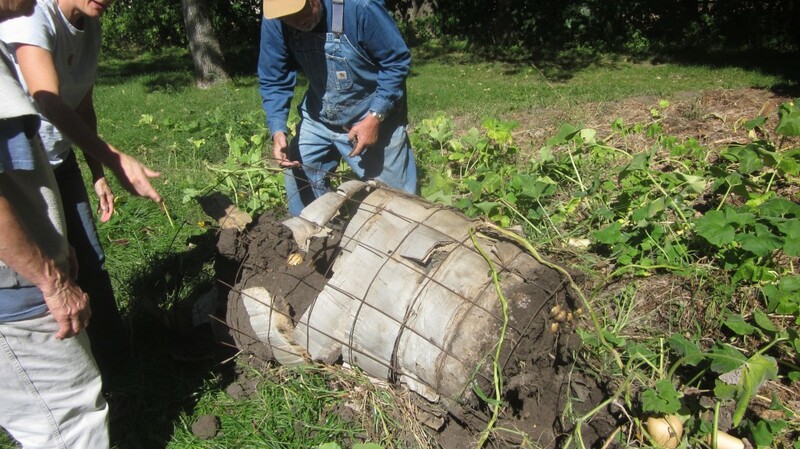 This is what he did, in case you didn’t catch my previous post about Dad’s potato planting prowess. He planted a few seed potatoes in the bottom of a tomato cage, and then as the plants grew, he heaped in dirt, lining the outside of the cage with strips of cardboard to keep it all in. Dad also snaked a soaker hose down through the dirt and made sure the tower was nicely watered during dry spells. Other than that, he did nothing except let the thing grow. Of course we all visited the tower several times, to check on its progress and of course . . to wonder . . . and in my case, anyway . . . to dream. Here’s my cute Dad with his potato tower. The potato plants, at this point, had not quite reached the top of the tower. After all, when planting potatoes you can’t know if you’re going to have a decent crop or a failure until the day you dig them! So the day has come. Dad called me yesterday and said that the potato vines had died down, and that he was ready to excavate the tower. I begged him to wait until I could come the next day. “I’ve got to write about this!” I said. “I’ve got to document the bushels and bushels . . .” Such was my optimism! “You may not want to, if it’s a bust,” he hinted. And then he admitted that he’d dug around in the top of the tower and hadn’t found anything. I refused to be realistic pessimistic about the experiment. I could just picture the piles and piles of potatoes! “My readers have been waiting for this, Dad,” I said (and it’s true that I have received a few e-mails this summer asking me when I was going to write about what was inside Dad’s potato tower). “I’ve got to write about it, whether it’s a boom or a bust. I owe it to my Gentle Readers.” Dad agreed to wait until today, when I could come over to witness The Big Reveal of the potato tower. This proves my devotion to you, Gentle Reader, of course, waiting for an added 24 hours so I could share this experience with you. Are you ready? Are you sitting down? You may not want to read the following if you tend toward heart problems, or if you’ve already had a tad too much coffee today. That’s my disclosure. So here’s what the potato power looks like, after a season of growth and then the inevitable dying-down of the foliage. Dad gazes at his potato tower. . . and wonders. A nice cluster of potatoes. Well! Hardly the bumper crop that we had dreamed of, after all! I had imagined hauling bushels and bushels of lovely potatoes away from that tower, and what we found I could have hauled out in my outstretched shirt. Oh well. Thing One: When you jump into a new gardening experiment, start small the first year. It was a bit disappointing to topple the tower and find just a handful of potatoes at the bottom. But it was just one tower’s worth. It just took a few minutes to plant, and not much time to maintain. It would have been crushingly disappointing, say, if Dad would have gone whole-hog (like one of his daughters, ahem, tends to do . . .) and planted a dozen of these towers . . . (uncomfortable clearing of the throat) . . . um . . . on to Thing Two . . .
Thing Two: There are many basic gardening principles which just do not change over the years, including (but not limited to!) the fact that potatoes like to grow underground. There are all sorts of fun and interesting trends in gardening currently, including planting your crops in pallets, or towers, or piles of tires, or crates. But the fact is that most garden plants just prefer to be planted the way your grandparents planted them: in rich, roomy, garden soil, with a nice addition of manure and/or compost. That just doesn’t change. So that’s it, Gentle Reader! The Big Reveal! Dad was a bit sheepish about the whole deal, but there is something fun and worthwhile about trying something new in the garden every now and then, even if all you learn is . . . to never do it again. 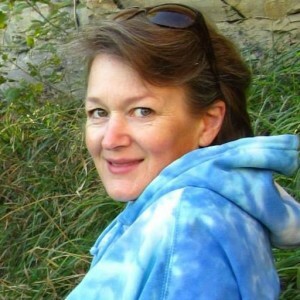 I’ve shared this post with The Prairie Homestead’s Blog Hop this week. Hop on over there to learn something new this week! What an interesting experiment! I just read a bunch of stuff about growing potatoes a few weeks ago. One of the things the author said is that potatoes like air–that they respond to air in the soil by making more potatoes. (I guess that’s why hilling works so well.) 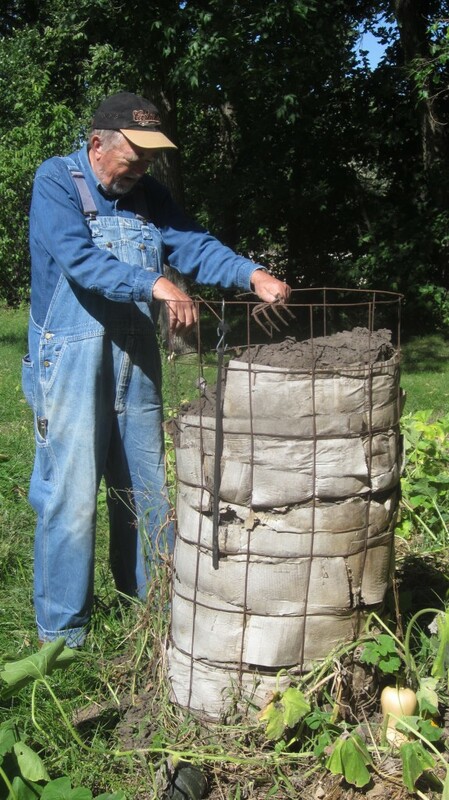 This guy says they grow great in big burlap “grow bags” that allow air to flow into the soil from all sides. I wonder if the potatoes would have been more prolific if instead of cardboard this same tomato cage experiment was done with something more breathable. Dawn, that’s an interesting observation. Maybe next year I’ll do a “burlap bag potato garden” for experimentation? So my first thought was, yeah, sounds about right. My mom tried vertical planting potatoes in tires as well and had about the same results. My second thought was for clarification. Did he truly just leave it alone all year except for some water or did he give the potatoes fertilizer? To me, it looks like a tall planter. I know that anytime you put a food plant in a pot, you have to feed it weekly since they don’t have access to surrounding soils for nutrients. You bring up a valid point, although since he scooped the dirt into the tower from the surrounded (very fertile) garden soil, I wouldn’t think that lack of fertility would have been an issue? Roy, since the tops of the potatoes (the blossoms, too) were always exposed to the air, I don’t think that was the issue. I just think the plants put lots of energy into growing that 5′ tall vine, and forgot to put on much fruit! A cool experiment though. A few adjustments and maybe…. Melinda, maybe . . . or maybe just stick with the time-honored drop-the-potatoes in the trench and mulch heavily method? Aw. It would have been nice for all of us space-challenged people (for example, if our community garden goes away – which may be a possibility in the next couple of years) to be able to easily grow potatoes. Scratch the potato tower method. But, isn’t gardening all about experimenting? Taking gambles on new varieties, trying to beat the last frost of the spring? 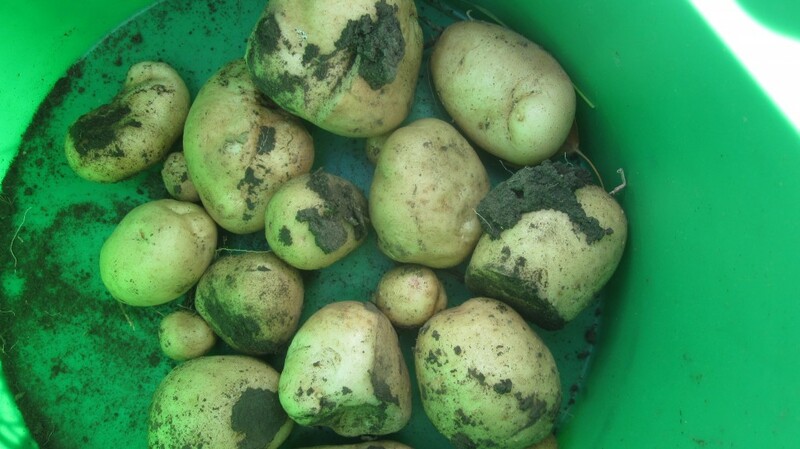 Well, there were a FEW potatoes, just not the bumper crop we had hoped for! Well, I love your Dad’s potato tower.,and I love the littlest potato in the world – do thank him for letting you document the reveal for us. Dad will read this, Caro, and you did just thank him. Thanks always for reading! Haha. Nature perfers it’s own invention. Full Stop. Thanks for the big reveal, proving that we should stick to the time-honored method of growing. At least for potatoes. It was a bit of a disappointment, Francene, but we learned something! Looks like a great experiment Amy and how small is that baby potato? It’s the smallest one I’ve seen! it’s the smallest potato I’ve ever seen, too! I’ll look forward to catching up with your new series, too! Awww how cute is that baby potato. I have yet to look at our potatoes. Hmmm maybe a job for tomorrow. Your Dad’s potato tower is so cool btw. It is the tiniest potato I’ve ever seen. Not sure how Mom is going to even wash it, without it slipping down the drain! Brings back very fond, very early (cus he died when I was 5) memories of my grandad pulling up tomatoes. Can remember the pitchfork he used to pry them up and the smell of the dirt on my hands. Wow. LONNNNNGGGGG time ago…. Happy to have jiggled that memory up for you, anyway! Or should I say “dug” that memory up? Yes, Barbara, at least we got a few! Thanks for the ideas! I’ll pass them along to my dad! 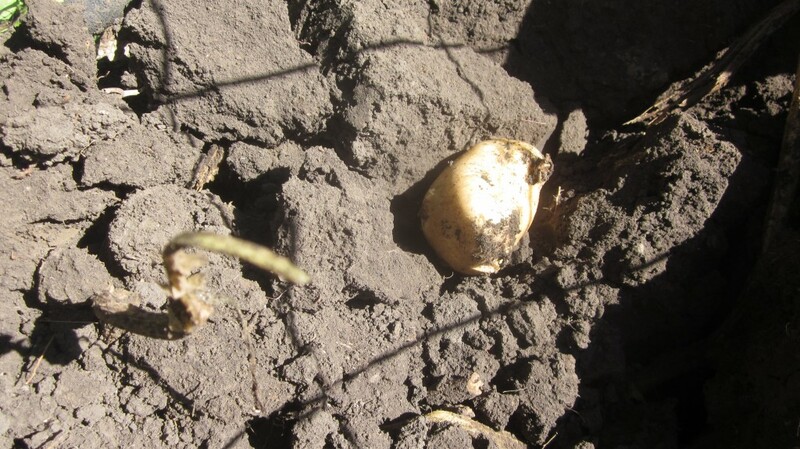 I think if you had started the seed potatoes at a level 2-3 feet above ground your harvest would have been better. That way they would have grown downwards and upwards at the same time. I had the same problem with the tire tower a few years ago, starting it higher fixed my problem. Aha! Thank you, Anita Black, we’ll keep that in mind for this year’s potatoes! What? Why has nobody ever told me this before? 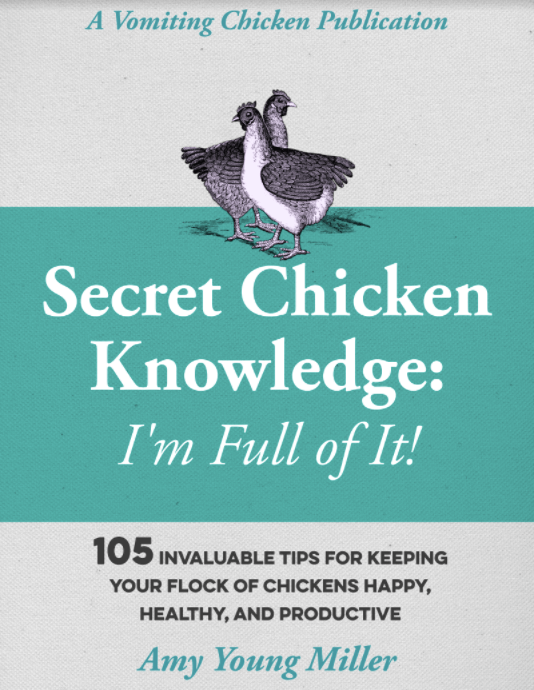 Thank you so much, Lynne, I’m going to look into this! Shazzylynn, You are right. I stumbled on to this article a while back and think it might prove helpful with this potato problem. 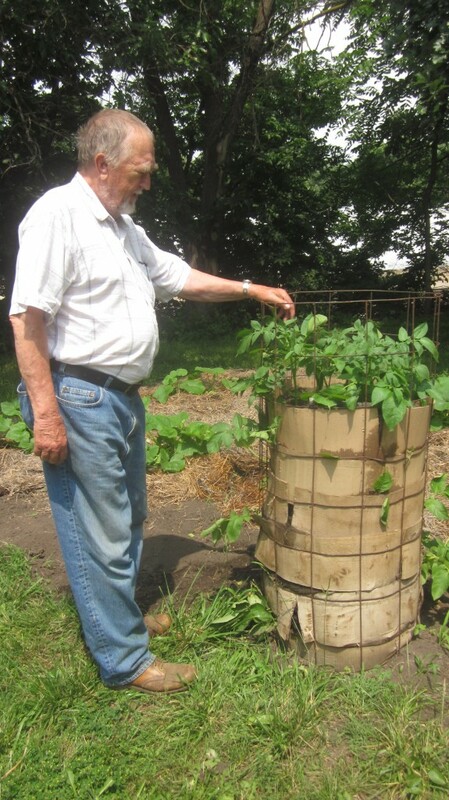 Grow a few potato plants, each or in their own wooden box, crib, barrel or wire cage. The container should be about 18×18 inches at the base, about 24-30 inches tall, and able to be gradually filled with soft soil or mulch as the vines grow. Set each container atop a well-prepared fertile soil. 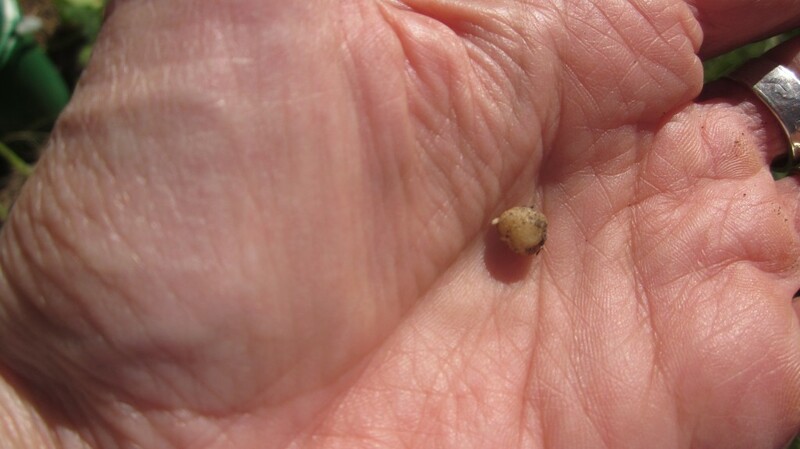 Plant one strong seed piece and cover lightly with 4 inches of soil. As the vines grow, gradually fill the container with mellow compost, mulch or soil, but always make sure you don’t cover more than one-third of the vine’s new growth. 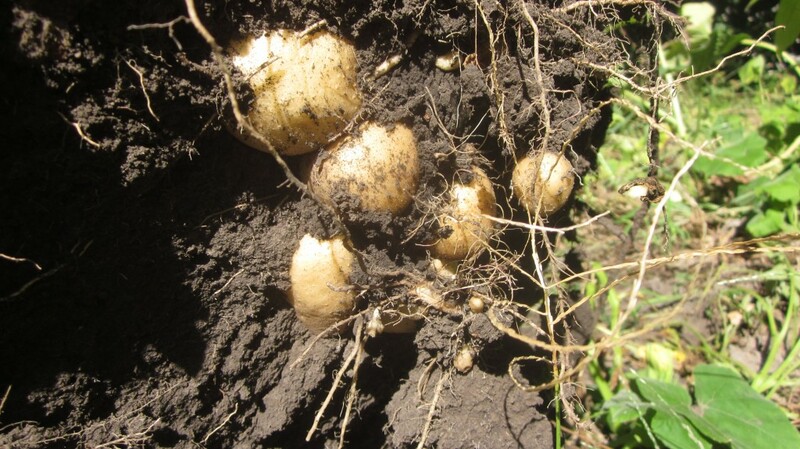 With some varieties, the underground stolons which produce potato tubers keep on forming new ones for some time. In containers the yield may be increased 200-3000 percent compared with open-field culture. This is a great way to grow a lot of potatoes in a very limited space. We recommend doing this with Yellow Finn, Indian Pit, Red Pontiac, or the fingerling types. Watering requirements will be greater however, so check the cages or containers frequently in warm weather.